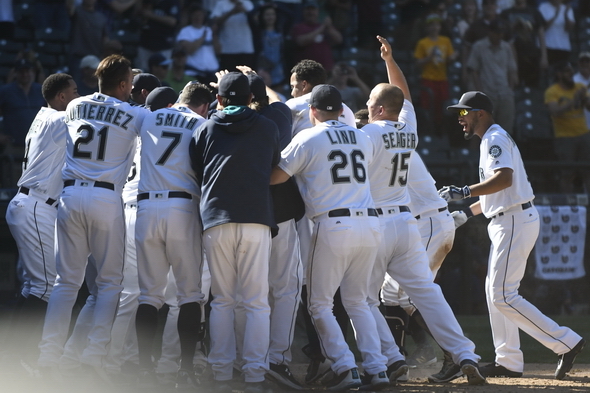 After losing leads of 4-0 and 5-4, the Mariners needed to go 11 innings before Chria Iannetta took care of business with a walk-off homer to secure the Mariners’ 19th win in 26 games. The Mariners wrapped up their second sweep in less than two weeks on C Chris Iannetta’s 11th-inning, walk-off home run, a 6-5 triumph Wednesday afternoon at Safeco Field (box). Seattle squandered an early 4-0 lead, and a 5-4 lead in the ninth, before Iannetta ended the four-hour game with a moon shot to center field. Iannetta hit a 3-2 pitch from Tampa Bay reliever Steve Geltz into the center-field stands for his third homer of the season. A big pitching story was the pitcher who didn’t throw a pitch. Closer Steve Cishek had the day off after earning saves in each of the first two games of the series. Nick Vincent came on in the ninth inning – in a save situation for only the second time this season – and served up the score-tying home run. Starter Taijuan Walker turned in an archetypal performance, dominating the Rays for five innings but losing his control in the sixth. Walker gave up a grand slam to .186-hitting DH Corey Dickerson in the sixth that tied the score 4-4 and prevented him from earning the win. Walker’s 5.2-inning performance, which included four runs off five hits with nine strikeouts — his three walks in the sixth equaled his walk total for the season — was indicative of the inconsistency he’s had since joining the Mariners. The Mariners took advantage of Tampa Bay starter Chris Archer’s wildness and jumped out to a 3-0 lead in the first inning. Three walks led up to Seth Smith’s two-run single. A Nelson Cruz homer to lead off the third only added to Archer’s problems, but Seattle’s bats went quiet after that. 2B Robinson Cano extended his hitting streak to 11 games with a leadoff double in the seventh, and he scored the go-ahead run. The Mariners had just two right-handed hitters in their lineup Wednesday: Cruz and Iannetta, and both homered. Starting the left-handed-hitting C Steve Clevenger in a day game, against a right-handed starter, appeared to be a foregone conclusion, but Servais liked the combination of Iannetta and starting pitcher Taijuan Walker as a battery . . . Tuesday’s win guaranteed the Mariners of winning another series, their seventh in the past eight. Including the split of a four-game Houston series, Seattle has not lost a series since the Rangers took two of three at Safeco April 11-13 . . . The Mariners are 5-1 in extra-inning games, while Tampa Bay fell to 1-1. The Mariners take Thursday off before hosting the Los Angeles Angels in a three-game series that begins Friday. RHP Nathan Karns (3-1, 3.38 ERA) will be on the mound for Seattle, while the Angels’ starting rotation for the series has yet to be announced.